North Acton, Perival and Hampstead were the big winners of the latest Underground in Bloom competition, which this year had an emphasis on 'greener' gardens. All work on the tube gardens is done by employees in their own time, so it's a labour of love and a sign of proprietorial pride in the growing potential of their platforms, control centres and depots. Bromley-by-Bow was lauded for its hanging baskets, North Acton's huge home-made flower beds won it the cultivated garden category, Hampstead's station allotment got the edible gong and Perival's tubs were tops. Newcomers to the green scene, Arnos Grove Train Crew Accommodation, Osborne House Service Control Centre at the Northumberland Park depot and Neasden and West Harrow station were also recognised. 'Special' awards went to Finchley Central Station (anyone got any pics? 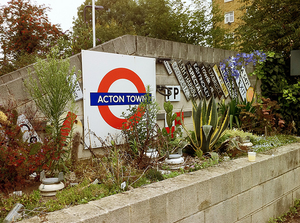 ), with Acton Town a runner up (pictured). Over 70 crews took part this year with entries to the fruit and vegetables category doubling from last year, when it was first introduced as part of Capital Growth. Better luck next year, Kilburn! Want to give your station's green-fingered efforts a shout out? Please do in the comments.